You don’t know what will happen if you go down that road. That’s why you should go there. Why do what you have already done? The world never changes, and it is never the same. Each step opens a new door to the same old life. Infinite variations on the same thing. 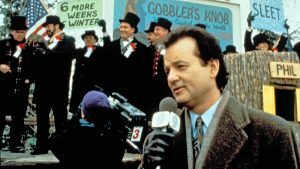 Remember Bill Murray’s movie Groundhog Day? Only weatherman Phil Connors knows that each day is a new day. What we tend to miss is that each day is also different for each person Phil interacts with—because Phil makes different choices each day. In fact, each day every other person makes different choices as well in response to Phil. Only none of them has memory of the previous days. They are still asleep. [After the annual Punxsutawney Phil appearance, all Phil Connors] wants to do is get out of town. He begins to. He doesn’t quite make it. What with one thing and another, he wakes up the next morning in the same bed, with the radio playing the same song, and it gradually becomes clear to him that he is reliving precisely the same day. Tomorrow and tomorrow and tomorrow, in his case, doesn’t creep in at its petty pace from day to day, but gets stuck like a broken record. After the third or fourth day, the enormity of his predicament is forced upon him. He is free to change what he says and does from one Feb. 2 to the next, but it will always be Feb. 2 for everyone else in the world, and he will always start from the same place. They will repeat themselves unless he changes the script, but tomorrow they will have forgotten their new lines and be back to the first draft of Feb. 2.